Southern right whales are suffering from an unprecedented mortality event in Península Valdés, Argentina. Over the course of 2012, 116 dead southern right whales were discovered in the local breeding area. This is the highest number of dead whales ever recorded in one season for this species. Southern right whale populations have been in a slow recovery since early whaling days, but since 2005, calves have experienced unusually high mortality at Península Valdés, which has slowed their population growth. Long-term monitoring has helped researchers assess the current situation. “Since we began the monitoring program, we’ve had years with as few as 13 dead whales,” said Dr. Marcy Uhart, Co-Director of the Southern Right Whale Health Monitoring Program and leader of the UC Davis One Health Institute’s Latin America programs. “In other years, like 2012, mortalities have been up to eight or 10 times higher”. 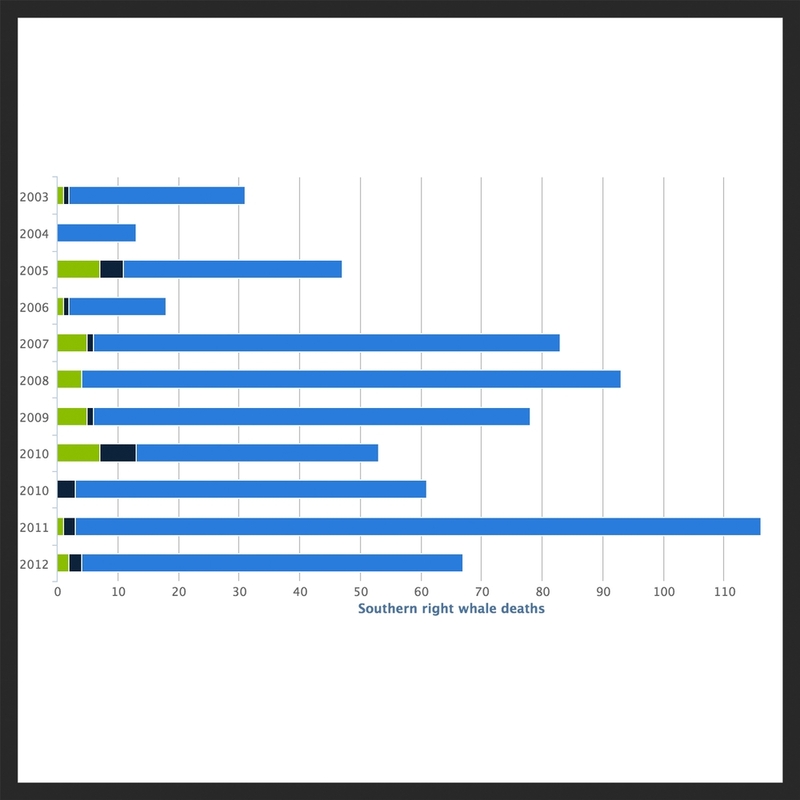 Despite ongoing research since the Southern Right Whale Health Monitoring Program’s establishment in 2003, the cause for the spike in mortalities remains a mystery. Scientists are focusing on kelp gull attacks that may influence whale deaths, along with other potential causes like nutritional deficiencies, infectious diseases, and biotoxins. Read in-depth here. Potential causes for the mortality event. Interactive chart of calve, juvenile & adult deaths. Gulls peck through skin to feed on blubber. The whales are indicators of ocean health.